You can't discuss chart music today without Ed Sheeran's name cropping up - having made epic and memorable music for years now, this gifted songwriter and musician manages to produce something for everyone. Being primarily an acoustic player, Ed appreciates the hard work that can go into quality guitar production and Martin certainly are the company to deliver. The Martin Ed Sheeran Divide Signature Edition Electro Acoustic Guitar builds on the strengths of its 2 predecessors and adds a refreshed design to compliment the "Divide" album visage. 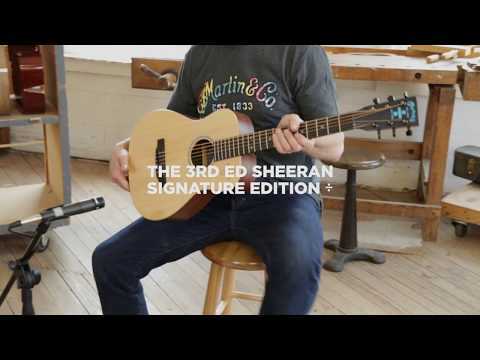 As you would expect from Martin, the Martin Ed Sheeran Divide Signature employs some premium wood to achieve the dynamic and responsive sound that you will love to hear. A solid sitka spruce top provides plenty of top end snap and projection and is complete with a decorative division sign. The back and sides of the Ed Sheeran Divide Signature Edition Electro Acoustic Guitar are crafted using Koa high pressure laminate. This is a particularly popular wood for those wanting a compact size guitar but are in need of a full bodied sound. The Ed Sheeran Divide Signature Edition Electro Acoustic utilises a 'low oval' shape birch neck, enhancing comfort and adding to the compact feel of the body. This is adorned with a richlite fingerboard containing a total of 20 frets (14 clear) and blue plastic 'Divide' positional inlays that match the large blue divide sign and Martin logo on the headstock. The Martin Ed Sheeran Divide Signature utilises a compact yet powerful Fishman Sonitone pickup system. This piezo based pickup clearly translates vibrations of the spruce soundboard into clear signal to be sent to any amplification and recording equipment. The Sonitone also gives you control over volume, contour and phase to "shape" the sound to your liking. Other key components that all add up to the superb performance of this compact and powerful guitar include a Richlite belly style bridge and a 16" Radius/Compensated/Black Tusq saddle. This works symbiotically with the black ping tuners (complete with small knobs) to produce a pure and resonant sustain as well as exceptionally solid tuning over long performances. The Martin Ed Sheeran Divide Signature Edition Electro Acoustic is an incredibly capable guitar that you are going to want to keep in pristine condition so to help you with this, a padded gig bag is included with every purchase. Now is your chance to own the exact same specification of guitar that Ed uses on stage, all whilst giving a helping hand to a UK charity. Please note: We also stock this as a left handed version. Fingerboard Width At Nut 1-11/16"
Fingerboard Width At 12th Fret 2-1/16"
Bridge String Spacing 2 1/8"